I (Ali) took a little warm up ride last week because the weather was incredibly warm and eerie. I took four days to ride from Toronto up to lake Simcoe, then around the lake and back into Toronto. It was a neat ride, but also strange as there were mid-July temperatures in mid-March. Very little had emerged out of winter hibernation yet, I only saw a few crocuses popping their heads up. 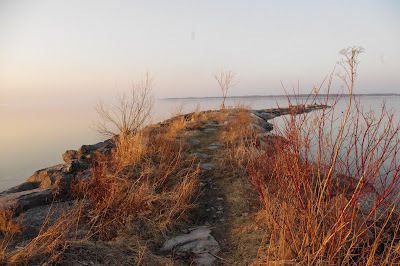 There were still ice floes on Lake Simcoe, and they misted like mad in the mornings. It all had an apocalyptic kind of feel. I camped in provincial parks for the first and third nights, but they weren't technically opened so I pitched my tent in these giant campgrounds all alone. It was very strange and lonely, but also amazing. The second night, I didn't end up in a park. I had intended to stay at Bass Lake park, but the whole park was gated with barbed wire...so I couldn't get in. Instead I found a little wetland conservation area a few kilometers away. However, being a wetland there weren't a whole lot of places to put my tent, so I hung out on a wooden pavilion, made some dinner and waited for dark. No one seemed to be around so I put my tent in I middle of the dry path...it was actually my best nights sleep. The biking was beautiful. Quite hilly for much of the ride, but incredible views and solitude. My knee actually started hurting a little on the third day, but I just took the hills a little more slowly and took more breaks and that seemed to do the trick. But certainly something I will have to pay attention to. 2. I am afraid to camp alone at night in abanonned campgrounds. I had flashes of myself being raped and killed each night. It is pretty incredible and disturbing what the mind can create. 4. I dont want to Bike the Americas alone. I missed Glenn intensely, and it is sooo much better biking with him...And not being alone in a tent at night!